Well, Helllooooo, New iPad Air. Have You Done Something Different With Your Hair? Apple has introduced a new iPad. Surprise! The new, 9.7-inch iPad is 20 percent thinner than the previous generation of iPad. And lighter. It’s so thin and light that Apple has borrowed the name from its ultra-thin laptops and renamed it the iPad Air. IPad Air! How did we not think of this before?! How was it possibly not leaked to the rabid tech press ahead of today’s event? It has Apple’s new 64-bit, super-fast A7 chip, improved graphics performance (72x faster, Apple said), expanded LTE coverage and faster Wi-Fi technology, with multiple antennas, while maintaining the current iPad’s battery life claim of 10 hours. It also has a five-megapixel camera and the new front-facing FaceTime camera that’s in Apple’s new iPhones. And there are new covers coming too — a standard version for $39 and a leather version at $79. It comes in silver and white, but natch, no gold. The iPad Air will start at $499; LTE version: $629. It effectively replaces some earlier iPads. 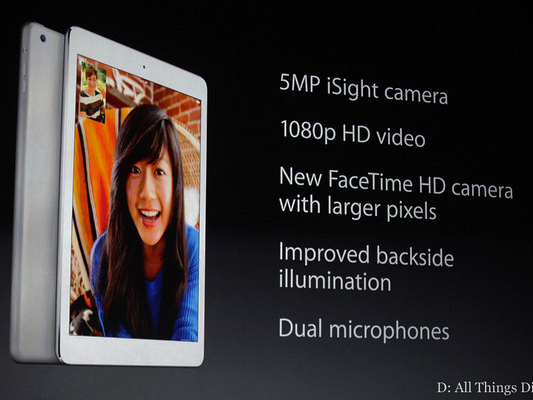 But iPad 2 remains in the lineup, at $399. New iPad Air ships Nov. 1. At the risk of sounding like I’m in a media echo chamber here, the iPad is important to Apple. Like, very important. Twenty-percent-of-the-company’s-revenue-last-year important. But iPad sales have been cooling. As smart analyst Benedict Evans points out on Twitter, “170 million iPads passed in October, 155 million in June … So under 15 million units in the fourth quarter. Flat sales. No surprise pre-refresh” (I’ve tweaked his tweet a bit). Last quarter, the company sold 14.6 million iPads. Sounds like a lot of iPads, but that was fewer than the 17 million it sold in the year prior, and well below the 18 million analysts had been predicting. It’s quite possible that some consumers were holding off while waiting for this anticipated refresh. So this particular iPad is crucial for Apple, especially as another holiday season approaches.